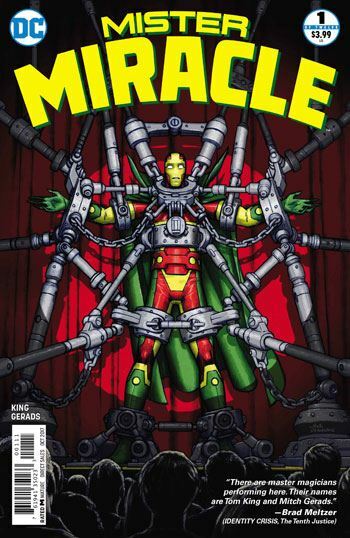 Mister Miracle is one of those entertainers that you see on the late-night circuit and television specials. But he is also a super hero from another world who almost looks normal but he appears to be crazy, as he feels that his adopted father can now play with the very being of reality and change his own life. 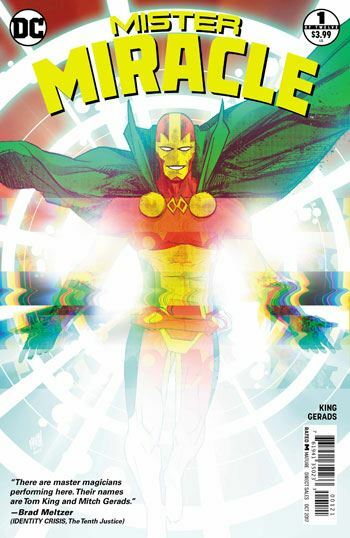 What can Scott Free, also known as Mister Miracle do? Whom can he trust? Whom can he believe? Raise your hand if you have ever bought a Mister Miracle comic. Right, exactly like I thought so. Most of you would have read about him in various Justice League comics or in the New Gods. He’s that perennial Jack Kirby hero who is the most normal of all and who could pass for a super hero. Is he the best to come from Jack Kirby’s Fourth World saga at DC Comics? DC Comics seems to think so and have given the character the star treatment by hiring Tom King and Mitch Gerads to tell his adventures in the 21st century. I am not complaining. Tom King plays with Keith Giffen, Alan Moore, and Grant Morrison by way of Jack Kirby nostalgia in this story. The structure of his story in terms of storytelling, follows a strict nine-panel grid wich King has perfected over the years. It’s different than the way a comic writer like Brian Michael Bendis presents a story even though it is as talkative. The nine-panel grid is used by Giffen to present repetitions and minimize camera movements and shots. King uses it to the same extent but plays with black panels inserted throughout the page to represent the ebb and flow of Darkseid’s power and control over Scott Free. The more black panels there are, the more power the villain has. It is effective. The borrowing from Moore uses the same nine-panel grid trick but also juxtaposes what is written with what is shown visually. You are not meant to just read the words in this comic. You must pay attention to the narrative dictated visually. There are no random elements in the pages drawn by Gerads. You will find plenty of Easter eggs throughout the comic. While Giffen does not play with layered meaning as much when he uses the nine-panel grid in his stories, Moore does. And this is what you must recognize as you read King’s Mister Miracle. He is emulating Moore. As for Morrison, well unlike Moore who may make you question reality but ultimately wraps his stories toward a real anchor readers can grasp, Morrison leaves things in the air, like a good old postmodernist. You will never know which of your senses to trust, which parcel of information inserted in the page matters and means something. And what about the situation Scott Free finds himself which borrows from the uncertainty used in Michael Allred’s Bug the Forager? The themes of this comic center around miracles and escape. Beating the odds is the most important thing for Scott Free as his entire existence is based on this. So when there is a checkered pattern on a page with black panels belonging to Darkseid, you can almost guess that Scott Free is playing a game of chest against his adopted father. At the end of the day, can the son escape the control of his father, even when doing so is about his own survival? Darkseid is pure evil and it makes sense that his sons, Mister Miracle and Orion would resent him and attempt to escape from his control. But the influence of one’s father is always almost impossible to escape. Even through death, Scott Free cannot break the influence of his father over his life and must be alive again and deal with the demons of his father. This is a different take on Mister Miracle for sure. It works on some levels but many readers will be left oblivious and told by reviewers that they must get and cherish this comic otherwise they have poor taste and questionable intellect. If I have a complaint about this comic it is that it will make the average reader feel unsuited for this while understanding that they cannot criticize it too much or dismiss it. This is how DC Comics has marketed this comic. We know we should enjoy it even though breaking into its rich and confusing subtext may require a PhD. Gerads is the ideal partner in crime to King. He reveals nothing of the big plan. He just adds layers and subtexts as needed to the extent that it will be impossible to figure out what was his exact contribution to this comic. Let’s tackle that one in another review.